In the USA, Europe and several other countries, two drugs have been approved for the treatment of IPF: nintedanib (OFEV)6 7 and pirfenidone (Esbriet).8 9 Each of these drugs received a conditional recommendation for use in the latest international treatment guidelines for IPF, identifying their use as an appropriate course of action in the majority of patients, depending on individual patients’ values and preferences.10 In this article, we present the data supporting the efficacy and safety of nintedanib as a treatment for IPF and discuss key considerations around its use in clinical practice. What is nintedanib and how does it work? How effective is nintedanib and in which types of patients has it been tested? The clinical trial programme for nintedanib included an international phase II trial known as the TOMORROW trial16 and two international phase III trials known as the INPULSIS trials.17 To take part in the INPULSIS trials, patients had to be ≥40 years of age and to have IPF diagnosed in clinical practice <5 years previously. If a surgical lung biopsy was not available, patients had to have honeycombing and/or a combination of traction bronchiectasis and reticulation in the absence of atypical features of usual interstitial pneumonia (UIP) confirmed by central review of high-resolution computed tomography (RCT) taken within the previous year to be eligible to participate. According to the latest international diagnostic guidelines, a diagnosis of IPF requires the presence of a UIP pattern (subpleural basal predominance, reticular abnormality and honeycombing) on HRCT in patients not subjected to a surgical lung biopsy; in the case of possible UIP (no honeycombing), a surgical lung biopsy is required to make a definitive diagnosis.1 As such, the inclusion criteria in the INPULSIS trials differed from the diagnostic guidelines in that patients who had features of possible UIP plus traction bronchiectasis were eligible to participate without a surgical lung biopsy. Patients also needed to have a forced vital capacity (FVC) ≥50% of the predicted value, indicating mild or moderate impairment of lung function, and a diffusion capacity of the lung for carbon monoxide (DLCO) of 30%–79% of the predicted value.17 About two-thirds of patients in the INPULSIS trials were male, mean age was 67 years, mean FVC was 79% predicted, and mean DLCO was 47% predicted (table 1). Across the two INPULSIS trials, a total of 1061 patients were randomised and treated with nintedanib 150 mg twice daily or placebo. Dose interruption or reduction to 100 mg twice daily was allowed for the management of adverse events. Patients who prematurely discontinued study medication were asked to continue to attend study visits and undergo assessments as originally planned. FVC decline across subgroups of patients in the INPULSIS trials by baseline characteristics (reproduced with permission from ref. 21). Are the benefits of nintedanib maintained in the long term? It is important to note that as IPF is a progressive disease, FVC will continue to decline even in patients treated with antifibrotic drugs. Thus, a decline in FVC in a patient treated with nintedanib does not necessarily indicate a treatment failure. Patients need to be informed that while antifibrotic therapy will slow the progression of their disease, it is not a cure and their lung function will continue to deteriorate. What are the most common adverse events seen with nintedanib and how should they be managed? Algorithm for management of diarrhoea in the INPULSIS trials (reproduced with permission from ref. 18). In the INPULSIS trials, clinical laboratory testing was undertaken at screening and weeks 2, 4, 6, 12, 18, 24, 30, 36, 44 and 52. Alanine aminotransferase (ALT) and/or aspartate aminotransferase (AST) levels ≥3 × upper limit of normal (ULN) and bilirubin levels ≥1.5 × ULN were more common in patients treated with nintedanib than placebo (ALT and/or AST 5.0% vs 0.7%; bilirubin 2.4% vs 0.7%).18 Liver enzyme elevations should be managed through dose reduction and temporary or permanent treatment discontinuation.18 In the INPULSIS trials, liver enzymes had returned to the normal range by the end of treatment in the majority of patients, with no cases of Hy’s law observed in patients treated with nintedanib. In a retrospective study of 32 patients with IPF conducted at a single Japanese centre, elevations in AST/ALT >3 × ULN were reported in 34% of patients.35 The reasons behind this higher incidence remain unclear but may relate to smaller body size and to more frequent blood sampling. What cautions need to be borne in mind when considering using nintedanib? 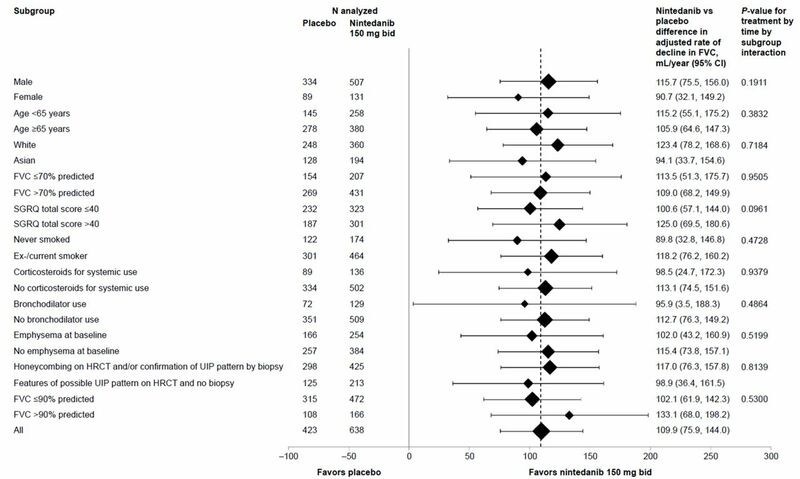 There are no data to support the efficacy of a combination of nintedanib and pirfenidone in patients with IPF, and there is some overlap in the adverse events associated with these medications. Trials of combination therapy with nintedanib and pirfenidone (ClinicalTrials.gov NCT02598193, NCT02579603) are ongoing and will report results soon. What non-pharmacological therapies should I consider when treating patients with nintedanib? Lung transplantation should be considered as a treatment option for patients with IPF who meet eligibility criteria. Patients with IPF should be referred for evaluation for lung transplantation as soon as possible to maximise the chance that they will be eligible.1 44 There are very few data on outcomes in patients treated with nintedanib who undergo lung transplantation and practice varies among treatment centres as to whether nintedanib may be continued until lung transplantation in patients with IPF. Nintedanib has been approved for the treatment of IPF in several countries and regions, including the USA and Europe, and received a conditional recommendation for use in the latest international treatment guidelines. Placebo-controlled trials have shown that nintedanib reduces the rate of disease progression in patients with IPF, with adverse events that are manageable in most patients through dose reduction, treatment interruption and symptomatic management of diarrhoea. Nintedanib has been shown to be effective across a wide range of subgroups of patients with IPF. Caution should be used in using nintedanib in patients with known risk of bleeding and in patients with high risk of cardiovascular disease such as those with coronary artery disease. Non-pharmacological therapies are an important part of the management of patients with IPF and should be individualised to the needs of the patient. The authors meet criteria for authorship as recommended by the International Committee of Medical Journal Editors (ICMJE). The authors received no direct compensation related to the development of the manuscript. Writing support was provided by Sorcha Wahlkvist and Wendy Morris of FleishmanHillard Fishburn, London, UK, which was contracted and funded by Boehringer Ingelheim Pharmaceuticals, Inc. Boehringer Ingelheim was given the opportunity to review the manuscript for medical and scientific accuracy as well as intellectual property considerations. Boehringer Ingelheim. OFEV (nintedanib) Summary of Product Characteristics. 2016. www.ema.europa.eu/docs/en_GB/document_library/EPAR_-_Product_Information/human/003821/WC500182474.pdf. (accessed Sep 2016). Boehringer Ingelheim Pharmaceuticals, Inc. OFEV (nintedanib) prescribing information. 2016. www.accessdata.fda.gov/drugsatfda_docs/label/2016/205832s001lbl.pdf. (accessed Sep 2016). Genentech, Inc. ESBRIET® (pirfenidone) prescribing information. 2016. www.gene.com/download/pdf/esbriet_prescribing.pdf. (accessed Sep 2016). Roche Registration Limited. Esbriet (pirfenidone) Summary of Product Characteristics. 2016. www.ema.europa.eu/docs/en_GB/document_library/EPAR_-_Product_Information/human/002154/WC500103049.pdf. (accessed Sep 2016).
. An official ATS/ERS/JRS/ALAT clinical practice guideline: treatment of idiopathic pulmonary fibrosis. Am J Respir Crit Care Med 2015;192:e3–e19.
. Effect of baseline GAP index stage on decline in lung function with nintedanib in patients with idiopathic pulmonary fibrosis (IPF). Am J Respir Crit Care Med 2016;193:A2691.
. No effect of baseline diffusing capacity of lung for carbon monoxide on benefit of nintedanib. Eur Respir J 2016;48:OA4959.
. Long-term treatment with nintedanib in patients with IPF: an update from INPULSIS®-ON [abstract]. Eur Respir J 2016;48:OA4960.
. Clinical experience with nintedanib for the treatment of IPF in 80 cases. Eur Respir J 2016;48:PA2086.
. Safety and tolerability of nintedanib in patients with idiopathic pulmonary fibrosis (IPF): one-year data from post-marketing surveillance in the United States. Am J Respir Crit Care Med 2016;193:A2692.
. Safety and tolerability of nintedanib in patients with idiopathic pulmonary fibrosis in Brazil. Arch Bronconeumol 2016;52:92.
. Pulmonary rehabilitation for interstitial lung disease. Cochrane Database Syst Rev 2014;10. National Institute for Health and Care Excellence (NICE). Idiopathic pulmonary fibrosis in adults. Quality standard (2015). https://www.nice.org.uk/guidance/qs79. (accessed Sep 2016).